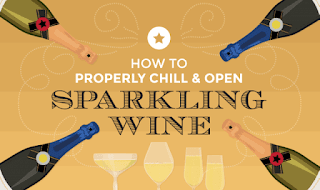 How to Properly Chill and Open Sparkling Wine #Infographic ~ Visualistan '+g+"
If you’re reading this, the chances are good that you’re cheering for, and with, bubbles. Sparkling wine has arguably never been a more popular beverage choice, especially in the U.S. The Wine Institute reported that in 2015, Champagne and sparkling wine sales in the U.S. grew by two million cases, topping off at an incredible 21.7 million cases that year.